The second son of Louis and Ella (Schoenberger) Loeb, Allan Louis Loeb was born in New Haven, CT, on April 26, 1916. Allan and Larry’s father was a prominent realtor, best known for developing the Guilford Lake area in Connecticut. As young men, the brothers’ home had riding stables and trails. After Louis suffered a stroke and only partially recovered, Larry took over the family real estate business, L. Loeb & Sons. A modest fellow, Allan worked as a newspaper reporter until WWII when he enlisted in the Army Air Force. After the war, Allan returned home to help Larry care for their parents and to join the family firm. Never married, the brothers took care of each other—cooking together, eating together, and making a life together as best friends. While the brothers’ private lives were quiet, Allan was a prominent public figure in many animal welfare and civic organizations throughout New Haven County. As founder of the Junior Humane Society of New Haven, Allan’s involvement resulted in the adoption by the state General Assembly of the robin (Turdus Migratorius) as Connecticut’s state bird. 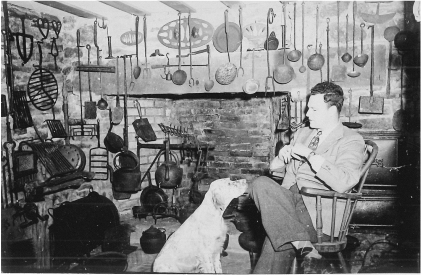 In addition, Allan was president of the Animal Welfare Association of Connecticut, formerly the Connecticut Women’s League for the Protection of Animals. In 1955, Allan co-founded the New Haven Animal Shelter with Mayor Richard C. Lee. This success led to Allan’s appointment by Mayor Lee to the New Haven Humane Commission. Through this role, Allan was able to serve also as an advisor to the Humane Society of the United States. ​from which the brothers ate. In the brothers’ later years, the farm was the love of their life. When Allan was no longer able to ride horses, he built a stable in the basement complete with a life- size plaster horse equipped with with saddle, bridle, and fresh hay. Allan’s culinary skills were appreciated at many garden club and historical society meetings, where sightings of his famous zucchini bread were a welcome treat. To friends and colleagues, Allan was known as a genial host and a charming conversationalist. Active until the end of his life, Allan was struck by a car and killed on December 7, 1996, as he left the annual seasonal gathering of the Madison Historical Society. Throughout New Haven County, Connecticut, Allan Louis Loeb lives on through the many organizations he influenced. With lifelong interests in antiques, gardening, and wildlife, Allan was a true gentleman and contributor to the world.